Sooner or later you wake up and realize you are so goddamn wrong. Right? Malaysia's prime minister says a huge chasm has opened between the West and Islam, fuelled by Muslim frustrations over Western foreign policy. Abdullah Badawi, seen as promoting a moderate form of Islam in largely Muslim Malaysia, said many Westerners saw Muslims as congenital terrorists. 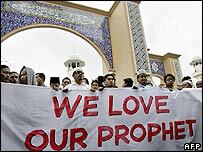 As he spoke at a conference in Kuala Lumpur, thousands protested outside at cartoons of the Prophet Muhammad. Their publication in Europe has led to demonstrations across the Muslim world. Friday's demonstration was the biggest in Malaysia's capital for years. "Long live Islam. Destroy Denmark. Destroy Israel. Destroy George Bush. Destroy America," protesters shouted as they marched to the Danish embassy in the rain from a nearby mosque. The satirical cartoons include an image portraying Muhammad with a bomb in his turban. Islamic tradition explicitly prohibits any depiction of Allah and the Prophet. The cartoons were first published by a Danish newspaper in September, but have since been reprinted in several other European publications. On Thursday, Mr Abdullah shut indefinitely a Borneo-based paper, the Sarawak Tribune, for reprinting the cartoons. He described their publication as "insensitive and irresponsible". The paper had apologised for what it called an editorial oversight. The prime minister had also declared possession of the cartoons illegal. Around 10,000 Muslims stage a silent protest rally in Bhopal, India, carrying banners reading: "Stop all anti-Islamic activities... Do not invite disaster." Nato defence ministers seek to soothe the dispute in scheduled talks with counterparts from six Arab nations in Sicily.